The chromosomes of eukaryotes consist of two elements; chromatin, a complex formed by DNA molecules, and proteins called histones. In order to bind efficiently to the negatively charged DNA via electrostatic interactions, histones need to be charged positively. Therefore, these peptides are especially rich in the basic amino acids lysine and arginine. In chromatin, the double helix structure of DNA wraps around a core of histones, with certain areas of the histones protruding from the formed “bead”, the nucleosome. Acetylated histones do not only play a vital part in the transcription of DNA. Their presence or absence is also associated with human diseases, such as inflammations, addictions and cancer. There are varieties of different histones, which are represented by different colors within the core of the nucleosome (see illustration). The various histones can be organized in five different families: H2A, H2B, H3, H4 and H1/H5, which in turn can be grouped into core histones (H2A, H2B, H3 and H4) and linker histones (H1 and H5). 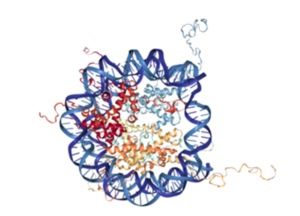 As the name suggests, core histones form the central part of the nucleosome, whereas linker histones connect the nucleosomes to form the so-called “Beads-on-a-String”-structure. Inflammatory diseases: Inhibition of HDACs leads to increased presence of acetylated histones and increased expression of inflammatory genes, after activation with inflammatory stimuli. COPD: In chronic obstructive pulmonary disease, a reduction of HDAC activity can be observed in the lung parenchyma, corresponding to the severity of the disease. Similarly, increase in HAT has been observed in bronchial biopsies from patients with asthma. Contrary to the modifications with small substituents (i.e. methylation and acetylation), post-translational modifications occur much more rarely with larger molecules such as biotin and ubiquitin, which can be classified as proteins. Nevertheless, these modifications play an important role for cellular processes. For instance, poly-ubiquitylation commonly flags proteins for degradation, while mono-ubiquitylation of H2A and H2B has been associated with regulation of gene expression. Histone biotinylation is an especially rare post-translational modification, with less than 0.001% of human histones H3 and H4 being biotinylated in nature. While rare, this modification, too, has significant biological importance. For instance, fibroblasts of patients suffering from holocarboxylase synthetase deficiency show severely lowered rates of histone biotinylation. There is also evidence that biotinylation is part of the cellular response to DNA damage, since the global biotinylation increases upon formation of thymine dimers in lymphoid cells (caused by UV irradiation). The role of biotinylation in signaling DNA damage is further corroborated by the rapid decrease in biotinylation of Lys12 in H4 upon double-stranded DNA breaks. Bachem offers various biotinylated histone sequences in its catalog and biotinylation is a standard modification, which can be offered as part of its custom synthesis service. Click on Histone peptides for more information. Click on Bachem histone sequences for product information. Click on Bachem HDAC substrates for product information.